JESSE A. 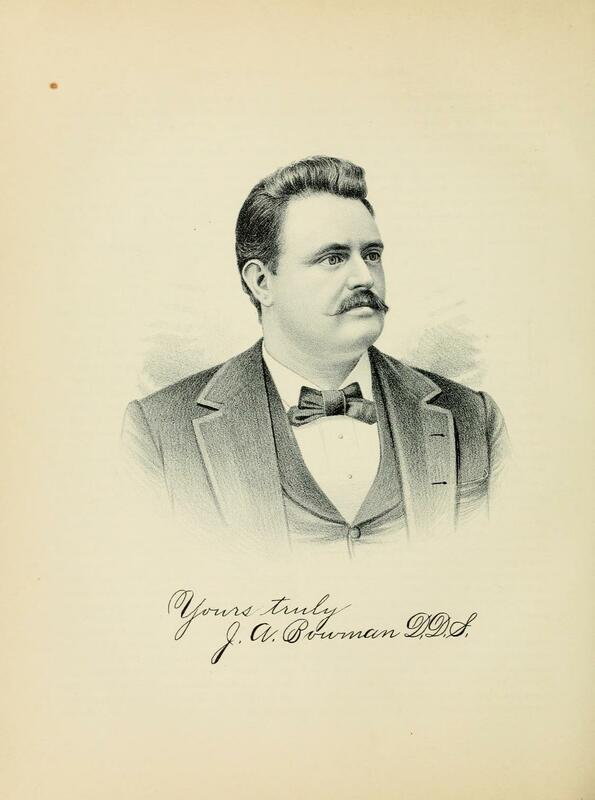 BOWMAN, D. D. S., of Shelbyville, though a young man has already won a high reputation for his complete knowledge of dental surgery and stands at the head of his profession in Shelby County. He is a native of Illinois, born near Rockport, in Pike County, December 27, 1863. His father, Joseph McEwen, was a well-known farmer of that county and for some years previous to his death, in 1868, resided near Rockport. His wife, whose maiden name was Nancy Moxley, survived him until 1870, her death occurring at Shelbyville. Six of their children were reared to maturity — William P., John, Mary, Jacob, Jesse and Thomas. After the death of his mother our subject was adopted by Dr. Joseph and Susan Bowman, of Shelbyville, and was carefully reared by them as if he were their own. He was given fine educational advantages, and was graduated from the High School in the Class of '81 with a good record for scholarship. He then adopted for awhile the vocation of teacher in order to secure money to prepare himself for the dental profession. He taught his first term in Ridge Township, and when he had sufficient money to defray his expenses at college in 1883 he entered the Indiana Dental College at Indianapolis, from which he was graduated in the Class of '84, with a thorough equipment for his chosen calling. After leaving college he formed a partnership with his father and was with him until Dr. Bowman's death in 1888, since which time he has been alone. He has pleasant rooms for the exercise of his profession and is well supplied with all the modern appliances that have placed the practice of dentistry to-day among the arts or sciences. His skill, combined with his courtesey and geniality renders him popular with everybody and has gained him a large patronage. The marriage of Dr. Bowman with Miss Anna Rice was solemnized in 1886. They have a charming home and their household is completed by the presence of the three children born unto them — Fred Homer, Carl Randolph and George A. The Doctor is well-known in social circles for his musical talent as he has a fine voice that has been carefully cultivated and he is one of the leading spirits of the famous Shelbyville Palmer Glee Club. This is composed of five members and is admitted to be the finest glee club in the State. It was a prominent feature in Gen. Palmer's campaigns in 1888 and 1891, being greeted with enthusiasm by the music-loving populace wherever it sang and it was called to Chicago during the mayoralty campaign there in the spring of 1891, and received many plaudits from the people and encomiums from the press. Our subjects and his wife are among the leading members of the Lutheran Church. He has been Superinteneent of the Sunday-school, Secretary of the congregation and for eight years has acted as chorister. Accompanying this biographical notice is a lithographic portrait of Dr. Bowman. Extracted 09 Apr 2018 by Norma Hass from 1891 Portrait and Biographical Record of Shelby and Moultrie Counties Illinois, pages 500-501.